A place to come with friends and family to unwind, whether your reading with the beautiful backdrop or kayaking and diving in amongst it all. Eastern and Western food available from our top kitchen team. Bungalows and rooms are all kept to a high standard of cleanliness and security. 5. Please make sure you come with sufficient funds as there are no ATM machines on the island. Currency exchange available. Only planned to stay a week but ended up staying nearly a month! Would highly recommend staying at easy tiger- the dorms are clean, the staff are great and the location is right on the beach front. We had a great time here and found it hard to leave when we finally did. Big thanks to Nick for your hospitality during our stay! Highly recommend this place. Fun social scene. Four beds per room. Cold AC. Super helpful planning outdoor activities. Even have an activity briefing every morning at 9am. Free bikes. Free beer at 6pm. Stay two nights, 3rd night free. You won’t regret. We loved our stay here. The staff are amazing and make you feel so welcome. Clean toilets, nice food and decent location! Only problem was security-the rooms don’t have lockable doors and the locks on the lockers in the room are way to big for anyone’s padlock so you have to basically take your valuables with you all the time. Other than that, would 100% stay again. Shout out to Anna and Nick! Amazing hosts! Stayed at easy tiger for 4 nights, nice hostel, nice staff, great food. No lockers which my travel companions were worried about but nothing was stolen. Location was ideal and the staff very welcoming. I wish they would of cleaned all the beds everyday because of all the sand being so close to the beach but still slept well. Would stay again. Vegie omelette was the bomb. Booked 3 nights in a dorm, when we arrived was told they overbooked and moved us into a bungalow (not complaining) only to be told that the next day we’d be moved to dorms, when we got back that evening was moved to a different private room (again not complaining) where we spent the next 2 nights but very limited facilities, no power points in the room and holes in mosquito nets. The owner Nick is a real nice guy though always makes an effort to see how your doing! Stayed here 2 nights and couldn’t really have done more than that. 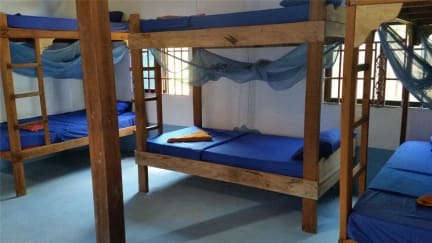 Very basic which is common for the island but the dorms were dark, bags got filthy on the floor, the fans did not keep the room cool and it was full of insects. No proper door, no security and the bathrooms were also full of insects. Bar area was ok and staff were nice, working hard to serve us but there wasn’t really enough staff at breakfast. Nice to be on the beach, but no WiFi, no comfort, $6 goes a lot further elsewhere.